The day before Christmas, the Carr house filled with the spicy smell of boiling plum pudding and the fresh fir scent of the Christmas tree. On Christmas Eve Father took Emily and her younger sisters into town to see the shops lit up. Every lamppost had a fir tree tied to it, and the shop windows were decorated with mock snow made of cotton wool and sparkly dust. In the grocer’s window was a Santa Claus grinding coffee. Bonbons, clusters of raisins, nuts, candied fruits and long peppermint candy sticks surrounded him. At the end of the food shops was Chinatown. Its dark streets held no Christmas decorations. Emily’s father turned them around to head back to James Bay. At the bottom of the stairs Emily peaked into the dark dining room and smelled the Christmas tree waiting there. She couldn’t see it, but she knew that it stood there, touching the ceiling and hanging heavy with presents ready for the morning. Up in her bedroom the air was chilly, and Emily dove under the covers next to Alice. She wiggled with excitement. Emily tried to keep still, but she tossed one way and then the other. How could she fall asleep when there were presents waiting? She tried not to think of the new set of paints she wanted or of the cuddly puppy she had longed for. She knew it wouldn’t do any good to wish for them, but she couldn’t help hoping that something special hung on the tree for her. Even rarer than sunny days in winter here, are below zero celcius days of dry cold snow. Sunday night I came out of the Ukrainian hall (after enjoying a colourful dance performance) in Strathcona, an old area of Vancouver, and it felt like I was walking into a different world. By then it was dark, the streets were pretty much empty, and there was a different feel in the air from the snow on the ground and the unusual cold. With the old row houses dating back to the turn of the last century, I could have been stepping back in time to Dickens’ world….Couldn’t resist going for a walk…. Yesterday was a rainy day sandwiched between two rare sunny days. Unfortunately, I was stuck inside on the sunny days and was out and about on the rainy day. As I left the house, giant wet snowflakes were coming down. By the time I got to Commerical Drive and downtown Vancouver, there was just giant wet. I still ended up enjoying myself — perhaps because haiku kept happening (and creating anything always puts me in a good mood), and perhaps because I was still feeling high from good news I received the day before. My first picture book story has been accepted by Orca Book Publishers (for publication in Fall 2010)!! I haven’t posted any graffiti images in awhile, so perhaps I’m due. 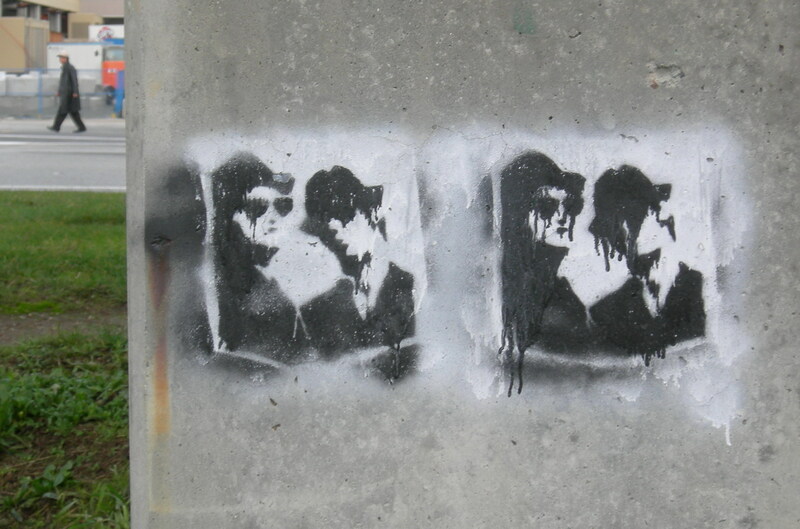 I’m always intrigued by stencil graffiti (which seems a little more rare), and here’s one that caught my eye today (under the Skytrain by Metrotown mall). The Blues Brothers made their first appearance on Saturday Night Live when I was in highschool, so catching sight of them out of the blue (so to speak) was kind of like unexpectedly hearing a favourite old song (btw, I never seem to tire of watching/listening to the first Blues Brothers movie). Where do writers turn for inspiration when they’re stuck? If you’re interested in hearing some children’s book authors and illustrators answer this question, check out the “Tuesday Tell-All” on the CWILL BC blog.